eD@HoMe: A lovely cover from Indonesia! Here is a very nice cover from Indonesia, many thanks to Febriani Savitri! 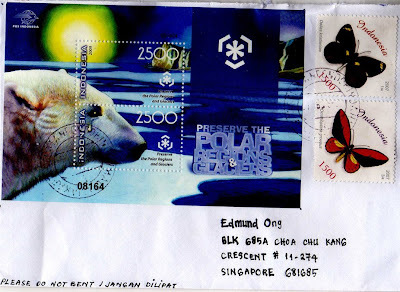 The souvenir sheet franked on this awesome cover belongs to the "Preserve the Polar Regions and Glaciers" series, issued in 2009. 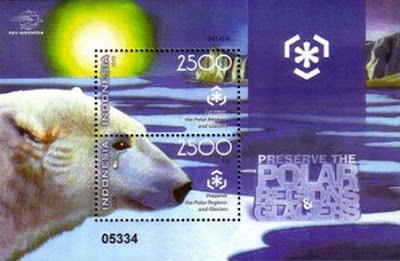 It was dedicated to raising awareness of the fragile state of the Polar Regions and Glaciers in this era of global warming. 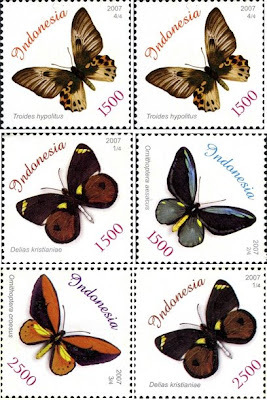 The 2 butterflies stamps franked on the right of the cover are from a set of 6 beautiful stamps from the "Butterflies" series, issued on 5th November 2007. That's all for today. Till next posting. Bye!